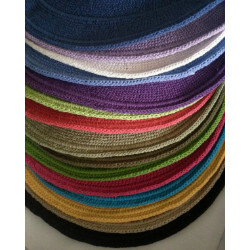 Cotton crochet hats are hand crocheted by a women’s cooperative in Bali so each is unique. 4″ brim and tight crochet for UPF 50 sun protection. Pack flat or scrunch it up to fit in bags or suitcases. For extra cooling dunk it in water and wear wet. Soft and flexible, can be reshaped. Will not hit the headrest of your car while driving. Hand wash on cold and dry flat.